If your appetite has recovered from the SBWFF, consider going to the Feast with the Beasts (FWTB) this Friday. The event benefits the Zoological Society of Florida’s wildlife education and conservation programs on behalf of Metrozoo. Other than South Beach, this is one party where you can sample delicious bites from over 40 top restaurants among live tigers, snakes, alligators, monkeys and other wild things. This year’s Feast starts at 8 p.m. at Miami Metrozoo (12400 SW 152 Street). Guests are encouraged to wear Carnival-style beads, feathers and masks to this Feast, where they will be treated to great food, 8 open bars, wild animal encounters, live entertainment, and a dance party. Some of the entertainment lined up includes DJ Donny Michaels, the Miami Heat dancers, Pyro Fusion fire dancers, and Flowering Arts Movement belly dancers. Limited general admission tickets to FWTB are available for $175 and Beastkeeper VIP tickets, which include a private cocktail reception at 7 p.m. cost $225. Those planning on attending should make advanced reservations. 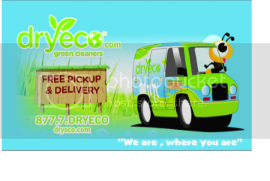 Sponsorship packages are also available. 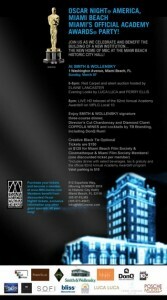 Visit www.fwtb.org or call (305) 255.5551 to purchase tickets or for more information. Head to Smith & Wollensky (1 Washington Avenue) for the Oscar Night® America (ONA) party on this Sunday, March 7, at 6 p.m. and you will get a piece of the action. For the eight year in a row, the Academy of Motion Picture Arts and Sciences has selected Miami Beach Film Society’s Cinematheque host and be the beneficiary of the official celebration in Miami for Oscar Night® America, Miami Beach. The red carpet and silent auction will be hosted by diva extraordinaire Miss Elaine Lancaster. Red carpet arrivals will begin at 6 p.m., where partygoers can catch a glimpse of evening looks courtesy of LUCA LUCA and Perry Ellis. Guests will then watch the Oscar® telecast live from the Kodak Theatre at Hollywood & Highland Center® in Hollywood starting at 8 p.m. During the show, attendees will toast Oscar winners while enjoying Smith & Wollensky’s signature three-course dinner with Coppola Wines selections, while bidding on exciting items during the event’s silent auction. Oscar® fans will also be able to predict the night’s winners using a ballot system and become eligible to win great prizes! Oscar Night® promises an experience that exudes the classic glamour and luxury of the 82nd Annual Academy Awards, complete with the Academy Awards® show program booklet for all guests. All proceeds will benefit MBC’s upcoming move to City Hall this summer. Tickets to the 2010 Oscar Night America Miami Beach are available for $150 or $125 for Miami Beach Film Society & Cinematheque and MIFF members. Visit www.MBCinema.com for tickets. Fenadegas’ First Annual Miami Tasting of Portuguese Wines takes place Monday, March 8 from 5 to 7 p.m. at Smith & Wollensky (1 Washington Avenue). For only $25, you get unlimited wine, approximately 100 whites, reds and roses replete with Ports, White Vinho Verdes and Moscatels. Seven winemakers will be present to personally introduce their offerings, which sure sounds too good to be true! The best part is that all this drinking goes to a good cause, benefitting the Florida Chapter of the American Institute of Wine and Food, a foundation created by the late Robert Mondavi, the late Julia Child, the late Richard Graff and others to provide a forum for the study and enjoyment of gastronomy. Granting culinary scholarships to aspiring students and running a national Days of Taste® program that teaches children about the culinary arts and nutrition. For more information and to buy tickets, visit: www.localwineevents.com or call: 866.887.WINE. Join the InterContinental Miami along with some of the nation’s top chefs this Thursday, March 11, for “Chefs with a Purpose: Haiti” benefiting International Firefighters Assistance in Haiti. From 6:30 – 9:30 p.m. guests will enjoy a variety of signature menu items from participating chefs, including InterContinental Miami’s own resident chef and the event’s Chef Chair Alex Feher, Gibraltar at Grove Isle’s Jeff O’Neil, Pacific Time’s Chef Jonathan Eismann, Talula’s Andrea Curto-Randazzo and Mandarin Oriental’s Clay Conley, among others. Admission is $50 at the door and includes food, cocktails, music by local fave, Joe Dert and valet. 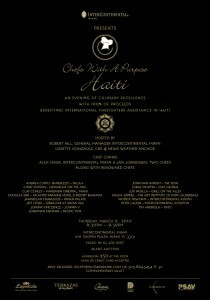 RSVP is required by contacting Helpforhaiti@taraink.com. The team that brought you Funkshion will kick off their new venture with the support of the team behind Design District and Design Miami. Matt Heien, Craig Robbins and others have partnered to form FASHIONmiami. The concept behind FASHIONmiami stems from the idea to consolidate multiple fashion events around the city and house them all under one roof – in one week. Saving our feet, cab allowance, parking fees and sanity. FASHIONmiami will host Gen-Art’s Fresh Faces shows, the FGI Emerging Designers Competition presented by Chrysler, a Haitian benefit with Haitian designers, Custo Barcelona, Funkshion, and others. The fashionable fun runs from March 10-13th. For more information, visit www.fashionmiamishows.com. Free tickets will be made available on the website.